The questions continue on my Tumblr but for today I don't have anything additional to post here. 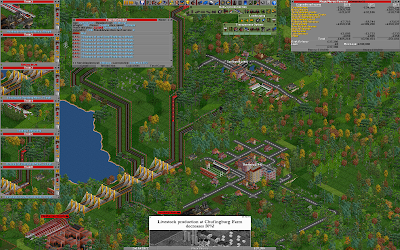 Too much work and Transport Tycoon! Now I should start thinking about May's Moments of Gaming. Also only one week left until E3! As much as I love Sim City and Theme Park, my favorite simulation game as always been Transport Tycoon. The concept of the game is pretty simple, run a transportation company and move passengers and goods from place to place. I don't know why exactly but I've always get quite addicted to it. It is many years old now but I still have a copy installed on my computer. Today I learned that a group of fans/programmers have been working on a new open source version of the game which "attempts to mimic the original game as closely as possible while extending it with new features". It's called OpenTTD (TTD being short for Transport Tycoon Deluxe) and you can find it here http://www.openttd.org/. I've been playing it this evening and it's great. It's just like the original Transport Tycoon but with the added features you always wished existed and modern updates like scroll wheel support and widescreen resolutions. I can see many more hours going in to this game for years to come. I missed this film when it was first released but I've always meant to see it at some point and this evening I did. Before watching this I knew very little about the original poem and only the very basic details about the story in general. Most of what I do know comes from a Star Trek: Voyager episode where there is a holodeck version of the story. Still demons and dragons along with some interesting CG work made we want to check it out. The big technical thing with this film is the performance capture system and the CG renderings of real actors. I suppose this has been improved on since with films like Avatar, but unlike the Na'vi human faces are being recreated here. They are all very well done and you can certainly tell which actor is behind the characters with ease. It's not perfect though and that is to do with the texturing and animation. The textures are not totally photo-real and so it has that obvious CG look. Also some of the animation seems a little stiff, slightly robot-like is the best way I can describe it. Part of that probably stems from the fact that it's over four years old now. It's the most obvious in the faces, particularly in the women. The men get wrinkles, stubble and beards to cover things up, but the women all seem too smooth. The general environments were great though. It gives the impression of a high-end cutscene from a computer game rather than a motion picture. That is until you get into the story and stop worrying so much about the look. It wasn't quite what I was expecting, especially with the look of Grendel, but I enjoyed it a lot in the end. I starting doing one of those silly thirty questions in thirty days things on my Tumblr account. Check it out if you want to learn some random facts and things about me. I suppose that a lot of the stuff I could just post here but Tumblr is a different style of site, so I'll leave that over there and continue as normal over here. So the other important thing today is of course, new episode of Doctor Who. The thing is it just didn't get me very excited so I don't have a lot to say about it. It wasn't terrible, it just felt a bit average. Matt Smith did do an excellent jobs as two Doctor's though. Now that we're reaching to mid point I'm starting to not like the idea of a split season, it's gone by too quickly! Let him who have understanding reckon the number of the beast! I was only meaning to post that it's late and I don't have a topic today, but as soon as I wrote 'time is short' my brain had to continue with the quote from the song/bible. Even though it's the end of a line in the middle of the quote. It's funny how memory works sometimes. 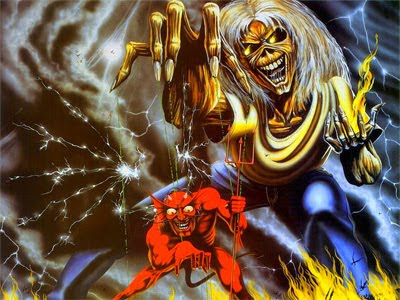 Is it time for a new Iron Maiden album yet? I'm not up to date on the news but I guess The Final Frontier has not been out that long and they're touring at the moment IIRC. So perhaps next year? Still in the mean time I must listen to Arch Enemy's new album soon. 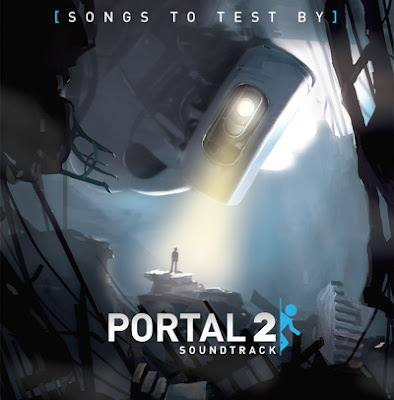 Fresh from the Aperture Science Psychoacoustics Laboratory is the aural stimulus package Songs to Test By (also known as the Portal 2 soundtrack volume 1). It's freely available for download by anyone, you can get your copy here http://www.thinkwithportals.com/music.php. I'm listening to it as I write this. If you're a fan of the game or interested in electronic music at all then I would highly recommend it. 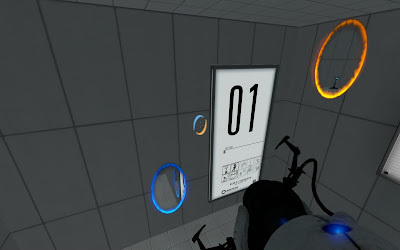 It's great to hear it clean without being distracted by GlaDOS and Wheatley while you're busy trying to solve puzzles. I've not heard it all yet but my favorite so far is The Friendly Faith Plate. 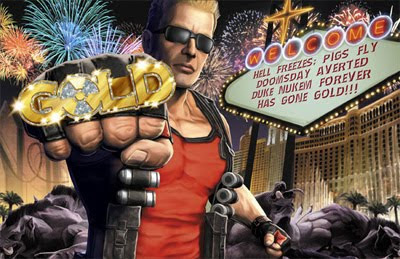 If you had said this only a year ago you would have been laughed at, but Duke Nukem Forever has gone gold! After so many years in development no-one ever expected to see it after 3D Realms went under. However Gearbox stepped in and finally finished it off. I wonder who they're going to market the game too after all this time. Anyone who can remember playing the last game when it came out will now be pushing 30. I'll always have a soft spot for Duke Nukem 3D as it was the first game I ever released a custom map for. I didn't even have a website at that point, I was just giving floppy disks to my friends. So now the new game has finally gone gold I have pre-ordered my copy of the fancy special edition. Of course there's still a chance the game will turn out to be rubbish, but it will always be a major story in gaming history. It's an age old debate but it's one I've been wondering about over the last week or so. I say PC vs Console but really the main issue here is PC vs XBox 360. Unlike the PS3 and the Wii, internally the 360 basically just a PC with a custom operating system. This is good for users as it's a much simpler interface. This is also good for developer as it provides a single hardware configuration for them to work with as opposed to the hundreds of thousands of different combinations of PC hardware. However this is now causing issues for PC gamers. Because of the similarity between the PC and 360 platforms many games are developed to run on both systems. However the 360 is nearly five years old now and the hardware hasn't changed. This had led to a lack of innovation, especially in terms of graphics. It's been many years since I saw a new game and realised that I would have to upgrade my PC in order to play it and that's because all the games which are cross-platform developed are stuck at 360 level. Now that's not entirely bad. It's not like graphics these days are bad by any means and the 360 does help brings games more into the mainstream. You can also understand why publishers want to develop for it when games like Call of Duty: Black Ops sell 16 million copies in only 7 days. What bugs me the most in this situation is when developers use the popularity of the Xbox to completely ignore the PC. Almost anything that can run on the 360 can be made to run on a PC without a lot of effort and yet some developers choose not to. The big recent example which got me thinking about this is LA Noire from Rockstar. After watching a couple of videos I decided I'd be interested in playing this but it's only available on XBox 360. Rockstar have done this before as well with Red Dead Redemption. Bioware almost did the same with Mass Effect but eventually that was ported to PC by a third party and they seem to have changed their stance since then, thankfully. Still I do actually think about getting a 360 sometimes, then I guess it wouldn't be a problem. Although some games you really do need a mouse and keyboard to play properly but that's not always the case. The thing is after five years you've got to wonder how much life the system has left at the point. There's nothing but rumors about a successor for the Xbox 360 or the PS3 but this generation of consoles has already lasted longer than any of the previous ones. The Wii 2 has been announced but rumors are currently saying it could be as late as 2014 before there's a new XBox. So what's a gamer to do? I guess I should be patient for now, at least until after the big E3 conferences which are only two weeks away now. And it's not like I don't have plenty of other things to play. Last month I briefly mentioned the new DLC for Mass Effect 2 entitled Arrival and my intention to play it. There's also an older one called Overlord which I had not played yet either. Over the last two days I have finally played both and also continued my second play through of the main game which I've been playing on and off for over a year now. I suppose there is no rush now that Mass Effect 3 has been pushed back to 2012 but still it's about time I finished this run. I played Arrival first. I was led to believe this was to be a bridging story between ME2 and ME3 but I'd say that's not exactly true. You can take the mission at any point during the ME2 storyline and it still fits in. It's more about foreshadowing that bridging. It's still fun though. What is it about Batarians and rocket powered asteroids in DLC though? That's two in two games now! Play time for this one is about an hour and a half. There are two new locations to explore but the majority take place in the second (the asteroid base). 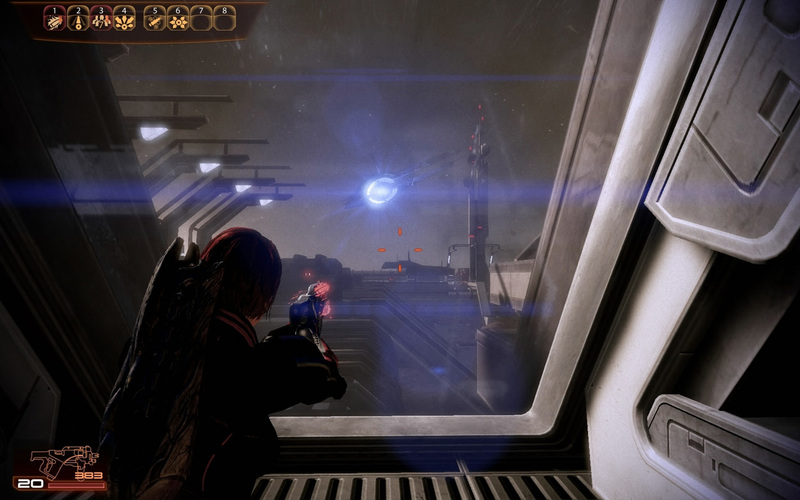 Overall this is a typical Mass Effect mission, rescue, chat, betrayal, combat, huge explosion. So the Reaper invasion has been successfully delayed, but for how long? We've already seen the trailer for ME3, the answer is, not very long! Overlord took longer to play than Arrival and the story is a little more generic, infiltrate a base taken over by a rogue AI and restore control. However some of the technical details during the mission are brilliant and make it much more interesting. The planet on which the mission takes place look stunning and is one of the best I've seen in the ME galaxy. 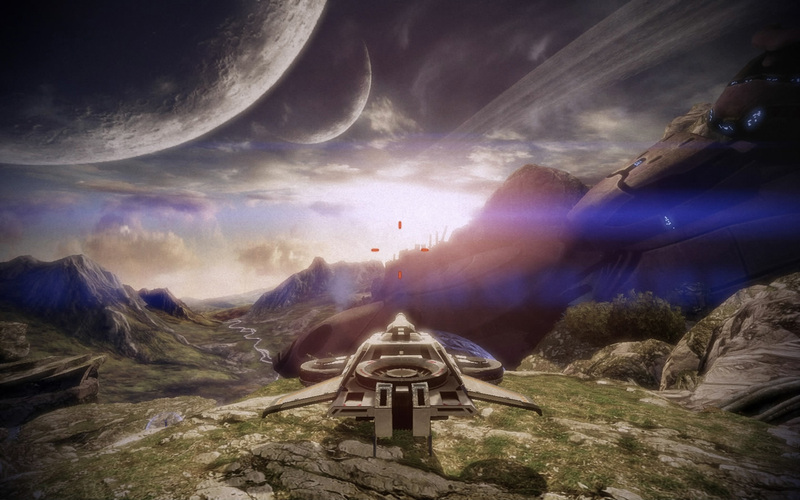 There are some great views, interesting lava flows and a crashed Geth ship. It also makes great use of the Hammerhead hover tank from the Firewalker DLC to get from place to place. Then at the conclusion there are some awesome visual effects added, but I won't spoil those any further. That is all the ME2 extras played now. Lair of the Shadow Broker is still my favorite, but Overlord comes second. It's interesting that it seems to be impossible these days to do a reveal of Superman without John Williams' theme. 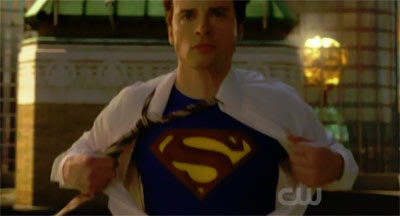 After ten years of Smallville Tom Welling finally got to wear the red cape, although it was for barely five minutes! Over the years I've watched a lot of Superman. It wasn't the first but Superman IV was one of my earliest cinema going experiences. I don't remember the order but I presume I'd seen at least one of the first three films on TV before that. I forget because I've seen them repeated on so many Saturday afternoons since. Then on top of that was the nineties where Saturday tea time was always about fish & chips and Lois & Clark: The New Adventures of Superman with the family. With the exception of a scan of Action Comics #1 I've never read any of the comic though. I think I'll stick with catching up on the X-Men for now though, there's far too much history in both those franchises to catch up on both at once. 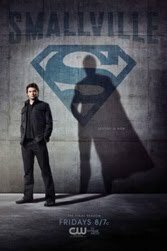 I didn't actually start watching Smallville when it first aired. I caught up much later, I think season six was airing at the time. I was probably too busy doing university things in 2001 when it started. However after it had been on the air for so long I figured that must be for a reason so I decided to give it a try. I've never regretted that decision. Like any long-running series it's not always been perfect, but it's always kept me entertained. My favorite episodes were always the ones related to the overall mythology and Clark's journey towards becoming Superman, rather than the general villain of the week type stuff. Of course of the episodes were always spread thinly as the producers tried to stretch the story for as long as possible and so Clark learned about one new power per year. The highlight for me was probably the creation of the Fortress of Solitude. So we've had a long ten year tease and flashes of destiny but unfortunately the grand finale was a bit of a disappointment. It started off extremely slowly with preparations for Lois and Clark's wedding day, complete with cold feet and second thoughts. Then Darksied's apocalypse planet arrives and that's all interrupted. So Clark jumps into action by running around and having a quick chat with all the major characters, some of which haven't even been in the show for a few years. 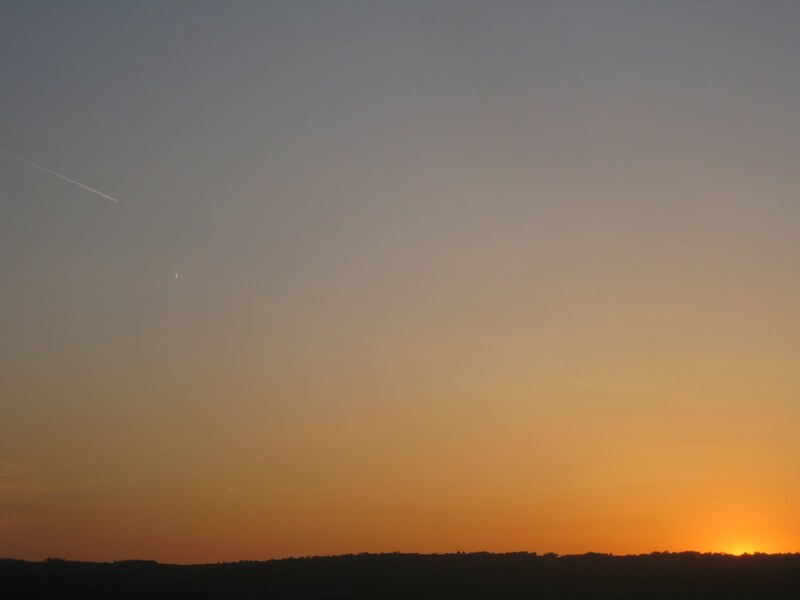 All this while meteors are raining down on the Earth. I understand that for Clark it's mental journey. He's got all this power but has to find the strength of will to use it and become the hero. Still I was expecting a little less talking and a bit more action. It's seems like they'd got too many plot threads to tie up in an hour and twenty minutes, especially when you spend the first half on a wedding that didn't even happen. Why did Green Arrow need to spend all the previous episode getting the Bow of Osiris? To shoot three of Darksied's minions in a thirty second throw-away scene? I thought it was going to be more important than that. Then there was all the parts about Lex and Tess. I appreciate where this all fits in the mythology but it didn't really affect Clark and so seemed a bit out of place here. That probably would have been better placed a couple of episodes earlier. My mind is not on my blog tonight. I'm trying to write a new tutorial for my website and as I mentioned yesterday I'm trying to focus on it and get it completed this weekend. I'd say I'm about half way though the process so that's a good point to be at for Saturday evening. I'll explain more once it's live online. I will say it's Portal 2 editing related, so no need to get excited unless you're in to that! Despite setting myself goals to stop such things happening I've ended up with far too many projects in mind at once. I always get distracted by the latest idea before I've finished the previous one. I realized I was doing it again today when I started thinking about a second Portal related project when I've barely even started the first and that's only supposed to be a minor hobby project. The same happens with my major programming work as well. I've got lists, charts and various scribbles but nothing really helps. My brain always seems to be working on more than one thing at a time and I find it hard to focus on one thing all the way to completion. Even as I write this I'm thinking about the new section I'm going to add to my website and keeping an eye on a data feed import for one of my business sites. Too much to do and not enough time! The more videos I watch by the Vlogbrothers the more I wonder what I ever did before I discovered them. It's been less than a year since I first watched one of their videos but I have watched the majority of their four year archive. What started simply as two brothers sending daily video messages to each other became this amazing community. Of course these days they only make three videos a week but they are always a treat when they pop up in the You Tube subscription box. Between the two of them they've got a extremely wide variety of knowledge and the content varies from silly or funny to insightful or informative, but they are always interesting. Here's John's latest about the similarities between Maths and Literature, which got me thinking about how my perspective has changed over the years. I'll try not to mention this too often as I've always tried to post an interesting variety of things on this blog rather sticking to one particular subject. However level creation for Portal 2 is my main personal side project at the moment so it's bound to come up a few more times. Especially on days like today when I don't have anything else in mind to talk about. I've not spent a huge amount of time using Valve's Hammer Editor yet. The majority of the time has been spent reading documents and tutorials to get an idea of the features of which it is capable. I posted a picture of my first box room a few days ago and not a lot has changed since then. However I do know a lot more now about things like triggers and logic relays. One thing I have now learnt and added is custom animated textures, which I have used for the test chamber sign you can see below. 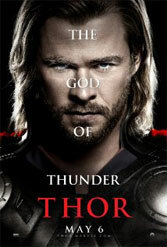 I know very little about the actual mythology of Thor. Names such as Thor, Loki, Odin, Heimdall or Asgard are all familiar to me but it's all sourced from fictional interpretations of the myths. Things like Stargate: SG1 where Thor and the Asgard are actually little grey aliens or from computer games like the old RTS Age of Mythology where things are extremely simplified. I know even less about the Marvel version of the character, other than the fact he is one of the Avengers. 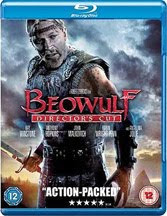 Of course the film tells you everything you need to know about this version of the story and it does so very well. It looks great and sounds great. For the most part it is well acted and it kept my attention the whole time. It seems to be getting quite a mix of reviews but it's doing well at the box office. I wonder if the power of Kenneth Branagh, Anthony Hopkins, Natalie Portman & Chris Hemsworth is bring people in but then all the dimensions, realms, wormholes, gods and frost giants it a bit much for some people. I was actually surprised how much time was spent in the realm of Asgard rather than on Earth. It's certainly not your typical superhero origin. Me personally though, I enjoyed it a lot and loved all the little nods to other Marvel happenings as things build towards The Avengers. I was going to post about Thor this evening, but I'm going to leaving that until tomorrow now. Of the birth of me. There were drinks last night which was fun and then tonight will be a quiet night at the cinema. Thor or Priest? Don't know yet, but both look good. Nothing much else to say, except Doctor Who was great. So it's that time of year where we begin to find out the fate of our favorite and not so favorite TV shows. We already knew that Stargate: Universe was no more and that Fringe is getting another 22 episodes, but we've heard a lot more this week. On the good side Bones is getting series 7 and House is getting a series 8 (although possibly the last by the sounds of it). Unfortunately most of the other news has been bad. V has been cancelled which is a shame. It wasn't the greatest show event but I was enjoying it and we're rapidly running out of sci-fi on TV. The Event has gone too but to be honest I'm not surprised about that. I have been watching it but it's been a bit of a mess the whole time. There will be no series 2 for The Chicago Code and that's disappointing. That's probably been the most impressive of the new shows this year and I was really getting in to it. Finally there are the pilots for next year. It was sad to hear 17th Precinct didn't get picked up for a full season, I was looking forward to that one. The new Wonder Women was looking worse and worse the more they showed of it so I'm not bothered that didn't get picked up. There is J.J. Abrams' Alcatraz though which might be interesting. I must remember to stop getting in to shows before season 2 as it just ends in heartbreak. 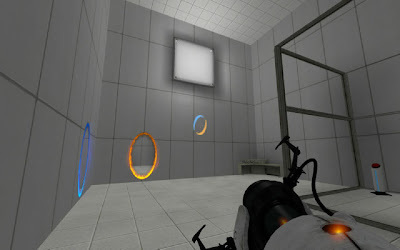 The map authoring tools for Portal 2 have been released for the PC version. It's been a good while since I did any pure map editing and I've never tried Value's Hammer Editor before so I thought I would give it a go. I've been jotting down ideas for test chambers and I've spent a couple of hours learning the basics and building my first room. Here's a (very early) work in progress picture. I suppose that this technically means that my posting streak is broken. However I can't really do anything about the Blogger posting system being down can I? I did have a post ready, but I couldn't do anything with it. I'm cheating and back-dating this post so at least the archive will be unbroken. Thing are apparently back to normal now. Let's see if this works. I've been thinking about it but at the moment I cannot recall another example. The Hitchhiker's Guide To The Galaxy is the only book which has been made in to a film, where I've read the book after seeing the film. This gives the book a different feel. 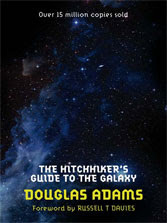 Of course Hitchhiker's Guide has has many different versions from film to TV series and radio shows. It's the nineties BBC TV series which first introduced me and is the version I know the best. As I read the book it was those actors I saw in my head. The thing is the series doesn't vary much from the book at all. So reading the book now it felt like a novelization of the series to me rather than the other way around. There area few extra details in the book but now very many and mostly only minor. In the book we get to know a bit more about Zaphod Beeblebrox where the TV & Film versions focus more on Arthur Dent. Still it's kind of fitting that I should finish this on the tenth anniversary of Douglas Adams' death, but that was entirely coincidental. Also Wheatley in space. A couple of nice pages I found yesterday with some nice Portal 2 drawings set to music. Our heroine Chell enjoying being outside for the first time in years (possibly ever). Chell in the Rain. Also one of Wheatley and his final outcome drifting in space. The Never Ending... Ending. Nothing to see here. Sorry I'm busy and lacking in ideas today. Not even a random photo to post. It's going to be one of those weeks I think. 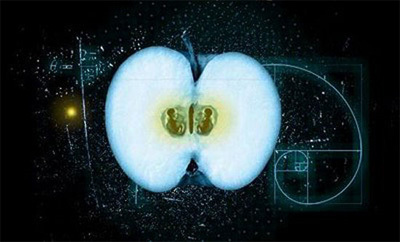 Season three of Fringe has been pretty consistently great this year and the finale this weekend was no exception. It didn't get there instantly but over time this has become one of my favorite (currently airing) TV shows. Interesting characters, weird science, alternate universes, mysterious watchers and now some time travel thrown in. It's got everything a science fiction fan could want. If you've not been watching it then you should give it a go over the summer now most other series are drawing to a close. Then you'll be ready for season four. More viewers are always required to avoid cancellation. Like most of the second stories in a Doctor Who season tonight's episode was fun and entertaining but didn't got much beyond that. After the big opening there is always a smaller/cheaper episode. 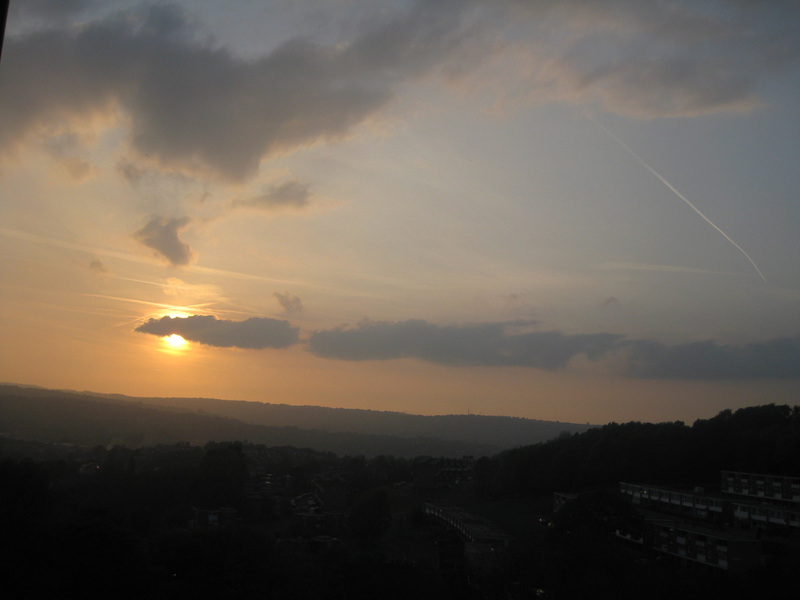 A step up from last week but I suspect it will be quickly surpassed as the season progresses. Couple of spoilers if you read any further. The one thing that seemed a little odd is that Rory seemed to be much better at resisting the Siren than anyone else who wasn't a regular cast member. Of course he then managed to die yet again! Although only briefly today. I know they're trying to keep the storyline going throughout the season but the epilogue with the repeated flash of the Doctor's death and Amy's possible pregnancy felt a bit unnecessary. It was only last week, I've not forgotten! Trailer for next week looks good. Ood! Try as I may I can't think of any particularly interesting topics to post about today. My Tron: Legacy BD arrived in the post this morning so I think I'm going to just watch that instead of racking my brains any further. Wait, should that be racking or wracking? Google seems to be divided on the issue. 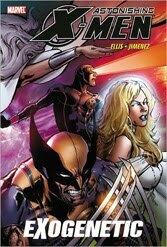 The latest Astonishing X-Men TPB was released recently containing issues 31-35. Here we've got a mostly stand alone story with the X-Men fighting against the Brood and some hybrid Sentinels. The Sentinels I know all about but I've never heard of the Brood before. Apparently they're a fairly major part of the X-Men lore, but I'm still learning the forty year back story. I'm going to have to go back and read some of the earlier issues in this continuity at some point as from time to time they do still reference events that I have no idea about. The artwork was good here but the story felt less exciting than previous issues. Overall enjoyable but probably a bit forgettable in the long run. It's hard to believe that I've been doing this for a year already. This is the 13th episode of Moments of Gaming (12th on You Tube). It would take nearly 2 hours to watch them altogether now. Last month I said that I'd save the new Mass Effect 2 DLC for April and I expected that would be the main focus of this video. That ended up not being the case and in fact I didn't play any Mass Effect 2 at all and I've still not bought the new DLC. I never really settled on one particular game this month so there's quite a variety in this video. That was until Portal 2 was released which I had forgotten was coming out quite so soon. So the main features of this video ended up being Portal 2 and a game called Trine, which I don't think I've mentioned on here before. I don't remember why but I never did a first impressions post for Trine, something else more important must have come up. It's quite a long video this month as I try to fit everything in and there was still so much footage that I left out. The biggest problem I had this month was with volume levels. There seemed to be more difference between the records of each game than the usually is. I must have changed a setting at some point or something. I've done something else new this month too. I've used You Tube's annotation feature to put notes on the screen telling you which game is which for people who haven't played them. It's not part of the original video so you can turn them on/off with the "speech bubble" icon in the bottom right of the video controls.